I have a known working and revised procedure below for the re-adaptation of the UDS Level Controller. This procedure is applicable for follow vehicles. - If there is an 'incorrectly coded' fault in the [34-Level Control], the controller will need to be coded first, before 'The Procedure' below can be completed! - If you have saved an [Auto-Scan] of the vehicle prior to the coding being lost, you can search the scan and copy/paste the coding into the controller. - In the unlikely event you have lost coding, create a new Ross-Tech forum thread in the Car Repair Support section and let's see if we can help. - Do not at any point in time select [Resetting of all adaptations]. If you choose to do so, DTC B2013 will be stored and you will need to make an appointment with your local dealer! B2013: No End-of-Line Programming will prevent a successful calibration. - If you are attempting to alter the ride height use this procedure at your own risk! 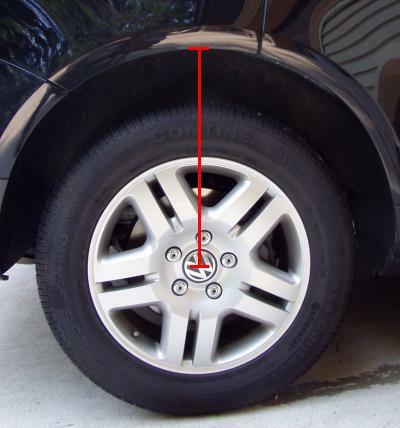 8) Measure the ride height, in millimeters, from the center of the wheel to the edge of fender, do this for all four wheels and record the values. A.) Measure the ride height again and verify the values are within 3mm of the displayed values in Advanced Measuring Value Blocks. C.) Ignition Key On/Off Cycle must be completed. D.) Clear ALL fault codes and re-check for fault codes, road test vehicle. Again, feedback is welcome and you are encouraged to post your experiences here in the Ross-Tech forum. Are you sure odis use that many logins? - The last time we received positive feedback, I had a caller on the phone and we did run through the rough draft of the procedure, it appeared that before each of the Basic Settings functions would complete successfully only if the Security Access was used. That is a good question though, is ODIS actually doing it the same way with the SA codes?? We have not tested that, ..yet. Yeah well this locked thread linked above is a great example of what not to do or how to act. The process above from Dr. Peter for me works very well in this thread. FYI: When I have tested it and I can confirm that sometimes sessions get dropped, further requiring a login again due to bad connectivity, otherwise it streamed right through. When after readings were in fact erased. I was able each time to input them by setting the sensors to full high in service position. I do this by disconnecting on lift and reinitiating the test path to do a final save. I find in some cases it is needed to have a second tech in the car to switch the ignition terminal 15 fast & between saving settings to eeprom in some controllers in steps or using a hand trigger wired if by yourself because there is limited time to lower car and get to the tester or switch! While some controllers will allow for function tests, adjustment or a first adaption to commence, you will find that after you have the EOLE or coding DTC's; that if you don't bypass an alarm zone or verify all the zones & battery voltage is at least 13.25 Volts at all times under load or you may get blocked in a routine. The main reason I disconnect ride sensors and lift the car, is to save the pump and not stress out the controller to get it done quick. If people marked the sensor positions front and back with timing marks, simply readjusting the position you can change height this way too much faster. In some cases I take the sensor rods off and make them adjustable with a double jam nuts for on the car mechanical connected calibrations for off road track use only! In this case a good FOD or test path for tweaked cars to obtain the specification. Don't know about ODIS, but with VCDS, you only need to key security code once (on step #1 of post #1). Everything else is spot on. And I'd put to set suspension on AUTO in bold, especially when your intention is to lower the car, and you left it in 'dynamic'. That's what I did, and had to get the module reflashed by dealer. Mastec tech said programming was corrupted when suspension bottomed out during calibration, aborting the procedure. Nothing can fix that other than reflashing the module. By the way, I'm the one that Jack linked above, and I see he said I'm the example how not to act? He was the one who behaved like a jacka$$ first (judge by yourselves), and I just followed suit. I apologized to Uwe, and asked him to remove the thread, since nobody knew how to fix my issue... plus it couldn't be fixed by VCDS anyway. Hi, i replaced the front Shock Absorbers and the lower arms on Audi A8 2013, after finishing the job i did the re-adaptation and everything went well but i have the right side higher than the left side, any suggestions please.